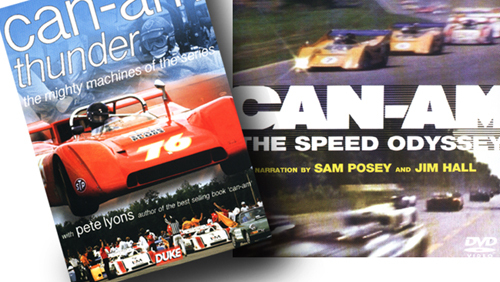 Some time ago I bought the two recently released DVD's about the Can-Am; 'Can-Am Thunder: The Mighty Machines of the Series' and 'Can-Am, The Speed Odyssey'. First of all, we, as Can-Am lovers, are blessed that finally these items saw light! In retrospect I can't understand how we could live our poor lives without these gems. Just reading and viewing static photo's.. Now, finally, we have moving images! It's hard to choose a favourite. The first one is initiated and narrated by the man who witnessed this series as a journalist and can be considered as a real Can-Am authority. The second DVD is narrated by a man who was actually one of the series' contenders. The first man, Pete Lyons, remembers vividly all kinds of details and tells with passion about the era. He certainly is the star of the film. But contemporary footage is scarce, and photo's and some 'modern historic racing' have to sub. On the second DVD Sam Posey, the Caldwell driver, doesn't sound too enthusiastic but footage is great and plenty. My advise: don't choose, buy both. It's a perfect combo. So what do you get? A very good impression of days gone by. Road courses with tire markers, poor pit facilities, legends like McLaren, Clark, Hall, Hill and Gurney, jet helmets, goggles and virtually no logo's, the first Shadow roller skate, various McLarens and Midland Machines, the wonderful T70's, the Porsche Pantzers, raw speed, four wheel drifts, nose-to-gearbox slipstreaming, sensational overtaking, smiles and disappointments, winner's laurels (why don't they have them anymore? ), a technical revolution taking place in a few years, the innocent sixties' atmosphere, interviews with Surtees and Peter Bryant, lots of people's memories and.. the thundering sound of big bore bangers! Wow! Now let's take a look at the DVD's with a Chaparral eye. What do we see? A pair of 2A's and the 2J riding on Rattlesnake Raceway! The last part of the heavy roll accident at Las Vegas '68! Active wings and flippers! The 'truck fender 2G' in the rain! Hap Sharp winning in a 2A! A glimpse of a riding 2C, lots of moving 2E, 2G, 2J! And.. hey, no riding/moving 2H? No, none, nope, nothing. It's the big disappointment to me. The '69 season is covered by a few lines and seconds of footage of the all conquering McLarens only. Unbelievable. And then it's on for 1970 racing footage. Pity. And there's a second, if smaller disappointment. The Speed Odyssey promises narration by Jim Hall. He does not. 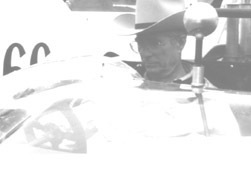 Oh yes, you hear him explain aerodynamics of the Chaparrals in a few words once or twice. That's it. But as I said, we are blessed these productions are finally there. It's a lot more than we had.